HJOW TO USE THE DREAM LOTION ? Welcome to the Organica Ingredients Page! Here you can find the full ingredient lists for all Organica products. 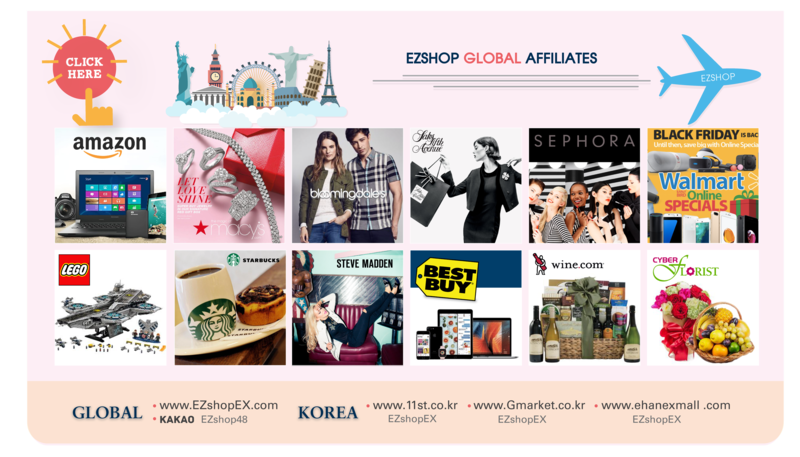 If you have any further questions please check out our FAQs or send us a message via our store form. Lavender Water (Lavandula Angustifolia), *Oatmeal Infusion (Avena sativa), *Oat (Avena Sativa) Kernel Extract, Almond (Prunus Dulcis) Oil , Lavender (Lavandula Angustifolia) Extract, Organic Jojoba (Simmondsia chinensis) Oil, Glycerine, Fair Trade Organic Cocoa (Theobroma Cacao) Butter, Stearic Acid, Mango (Magnifera Indica) Butter, Triethanolamine, Lavender (Lavandula Angustifolia) Oil, Cedarwood (Cedrus Atlantica) Oil, Cetearyl Alcohol, Bergamot (Citrus Bergamia) Oil, Clary Sage (Salvia Sclarea) Oil, Rose Ether, Caprylyl Glycol, Potassium Sorbate, Titanium Dioxide, Red 28, Blue 1. I JUST RECEIVED ORGANICA 'DREAM LOTION' BUT I ORDERED 'ADVANCED SLEEP LOTION' - IS THIS THE SAME PRODUCT? Yes - Organica 'Dream Lotion' formula is 100% the same! After the huge success of our beloved Organica Advanced Sleep Lotion, we have decided to add more products to the Organica line. To kick off the additions, we have changed the name our 'Advanced Sleep Lotion' to 'Dream Lotion'. 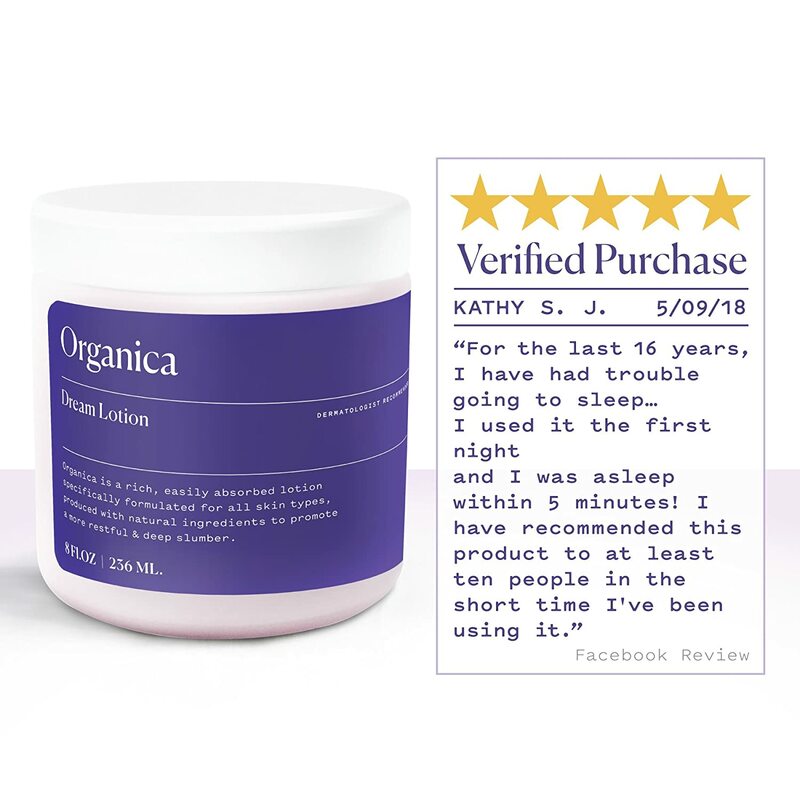 The formula remains 100% identical to what was formerly known as Organica Sleep Lotion. 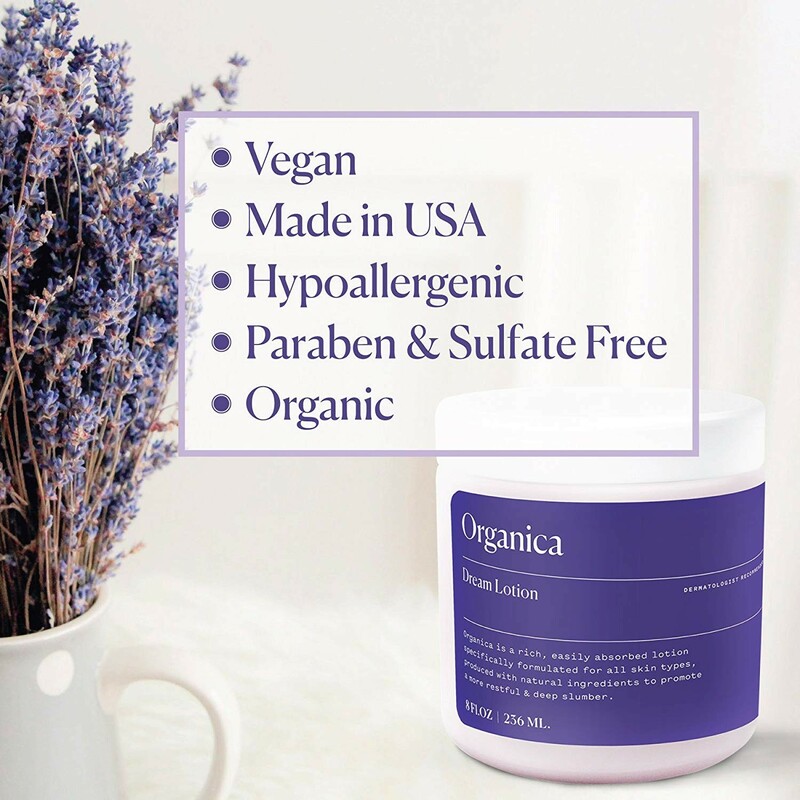 Organica Dream Lotion is formulated and packaged in the USA. WHAT IS THE SIZE OF EACH JAR? Each jar contains 8 fl oz of lotion. This lasts our happy customers anywhere from 1-2 months. Yes! Organica Dream Lotion is a gluten-free product. The oats used in Organica are gluten-free. It is safe for use by those suffering from celiac disease. 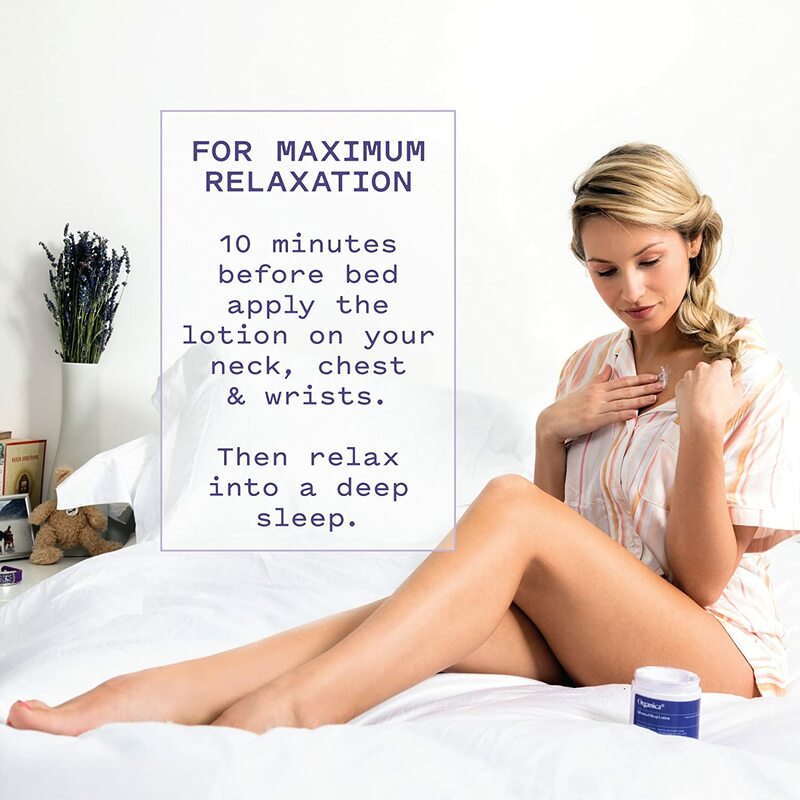 HOW SHOULD I USE ORGANICA SLEEP LOTION? To get the best out of your Organica Dream Lotion, we suggest applying this sweet lotion to your neck, chest, arms and wrist areas until completely absorbed. Applying a little to your chin, nose and soles of your feet, can be an added bonus too. Check out our video and more info here. Organica is hypoallergenic, so if you wish, you can apply this lotion to your face and/or rest of the body too. We recommend using roughly a little more than a tablespoon amount to cover these areas, but you can use as much as you like! IS ORGANICA SAFE FOR USE ON CHILDREN? Due to the presence and concentration of essential oils in our lotion, we do not recommend use on infants under the age of 6. IS ORGANICA SAFE FOR USE IF PREGNANT? We recommend consulting your Doctor before using this product if you are pregnant due to the presence of Clary Sage oil. Similarly, we do not recommend use if you are breastfeeding. I HAVE ASTHMA - CAN I USE ORGANICA? Everyone's physiology is unique, therefore, we advise you take note of the following: whilst the majority of our users suffering from asthma are not affected by this product, a few have reported the scent prompting a difficulty in breathing. If you have asthma and tend to be affected by strong scents, we would recommend caution in using this product.